Another very cold day - it actually snowed in Plymouth - and proper snow this time! As was expected the weather caused major problems in Plymouth yesterday. Having logged onto Twitter first thing in the morning I was please to see that buses were running on the main roads. It was clear that didn't include Keswick crescent but I managed to walk up the hill quite easily. Had I checked Twitter again just before I left home I would have picked up the message that Citybus were withdrawing all services as it was now snowing heavily. The message had got through to a few others at the bus stop so I set off on the long walk towards Derriford. Just up the road by Estover College I came across a FDC 15 stuck in the middle of the road half way up the hill, with another one stuck at the top trying to come down. 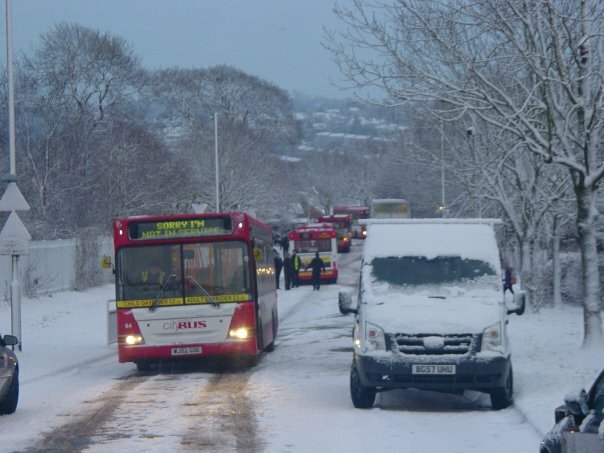 To my surprise a 47 came along Dover Road heading towards Derriford so i jumped on that, but it didn't get very far as it joined a queue of Citybuses stuck at the bottom of the hill near Thornbury School! Also saw a Target Travel bus doing a three point turn at the top of the hill heading back towards Derriford. Walked the rest of the way and ended up helping out a poor school girl who having got off the 47 didn't have a clue where she was so was getting a bit upset. Had to walk her up as far as Derriford Roundabout where she was back on track! It was also clear that no traffic could get down to Derriford Hospital from Derriford Roundabout so buses were dropping passengers off at the top of the hill and then turning around at the Marjon Traffic Lights. Finally came cross a Target Travel Solo on the 14 which seemed to be doing a three point turn on William Prance Road ( not served by the 14 at all). Glad to be in the warm office - just under an hour travel time. It was clear from all the updates during the day that some routes remained difficult. Keswick Crescent has not seen a bus all day and I don't expect to see in the morning either. As I write this up, its getting a lot colder outside and I am sure things are starting to freeze up again. By the time you read this I, along with many others will be getting ready for the journey to work again. Expecting ice to be a big problem - lets just hope that the gritters are out and about in plenty of time! Once again the Tweets and Facebook sites were used to the full and relevant posts are listed below. There were actually a lot more than this! 07:29 PLYMOUTH: Service 1/1A is not serving Oaklands Drive or Yellowtor Road. Service 2 is operating but not serving Pomphlette Road/Foresters Road. Service 3 is operating as normal. Service 4 is not serving the Keyham area but staying on the main roads. Service 5 is operating as normal. Service 6 is not serving Holmwood Avenue. Service 7 is not serving Marjons. Service 12 is operating as normal. Service 13 is operating as normal. Service 15 is operating as normal. Service 17 is only serving Southway Drive in Southway. CALLINGTON: Service 76 is not serving Launceston, buses are terminating at Callington. SOUTH DEVON: Service X80/180 are not serving Westonfields or Cole Lane in Ivybridge. TORPOINT: Service 81/81C are not serving Great Park. TAVISTOCK: Services 83/84/86 are not serving Whitchurch, Services 87/89 are not currently operating. SOUTH DEVON/DARTMOUTH: Service 90/90A/90B and Mayflower Link 93 are operating as normal. 08:03 Apologies to anyone trying to access our website - we seem to be having a few problems this morning. 08:27 PLYMOUTH: Service 11 is not serving Honicknowle Green, Service 15 is not serving Estover, Asda or Mainstone, Service 17 is only serving Southway Drive in Southway and s not serving Dunnet Road or Clittaford Road, Service 3 is not serving Barne Barton but terminating at St Budueaux Square, Service 7 is not serving Woolwell or Marjons, Service 6 is not serving Goosewell or Holmwood Avenue, Service 1/1A between Plymouth and Saltash is not serving St Stephens, Oaklands Drive or Yellowtor Road. 10:24 PLYMOUTH: Service 15 not serving Estover, Asda or Mainstone & will terminate at Derriford Hospital (but not serve the hospital forecourt). 11:55 PLYMOUTH/SOUTH HAMS/TOTNES: Service X80/180 is not serving Cole Lane and the estates in Ivybridge and Westonfields in Totnes. Service 93 between Plymouth, Kingsbridge and Dartmouth is operating as normal but not serving Aveton Gifford. 14:01 PLYMOUTH/SOUTH DEVON: Service 48 is turning at Seaview Drive in Wembury. 16:28 PLYMOUTH: Buses are operating in Plymouth and South Devon (mostly just on main roads) with some disruptions. Serving Derriford Hospital. 17:00 All North Devon journeys stated are subject to weather conditions - if the snow returns or roads become icy services may be suspended. 17:08 PLYMOUTH/SALTASH Service 1/1A between Plymouth and Saltash is now operating normally. 17:09 PLYMOUTH: Service 6 is not serving Goosewell or Holmwood Avenue and Broadway West. Service 15 is not serving Asda and Mainstone. Services 12 (City - Ridgeway/Chaddlewood) &13 (City - St Budeaux/Enesettle) are operating as normal. ervice 17 is still only serving Southway Drive in Southway and is not serving Dunnet Road or Clittaford Road. Service 3 is not serving Barne Barton but terminating at St Budueaux Square. Service 4 is not serving the Keyham area but staying on the main road, Service 7 is not serving Woolwell & service 11 is not serving St Pancras Avenue or Honicknowle Green. 17:47 NORTH DEVON:Due to icy roads the last service 1 bus from Barnstaple to Bideford will now be at 1905. Aplogies for any inconvenience caused. 22:16 Updates on First services in Devon & Cornwall will be available first thing in morning when we have had a chance to assess road conditions. 09:08 We are returning buses to the following routes. City Centre to Crownhill, City Centre to Marsh Mills, City Centre to St Budeaux Square. These buses will operate as best they can to no specific timetable. We are hoping to return to near normal once the gritters can get out and about. Please bear with us. 12:00 Pleased to say we can now add the 46 and 47 to the list of buses which will be returning to their route except they cannot serve Lower Compton and will operate via Henders Corner instead. 14:48 The 20 route is to operate the route with the exception of the Woodford Estate. Service 25 will be back shortly. 16:16 21 and 51 now back to normal route in Plympton.